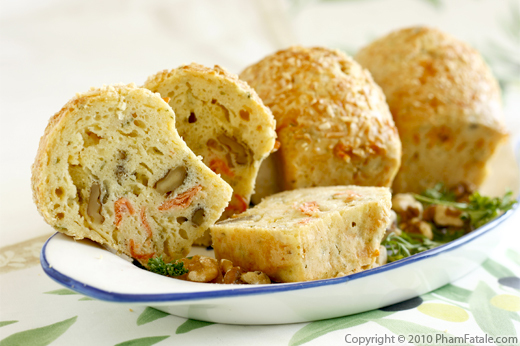 Making savory muffins is one of the easiest fancy, light accompaniments you could prepare. The batter can even be prepared in advance. 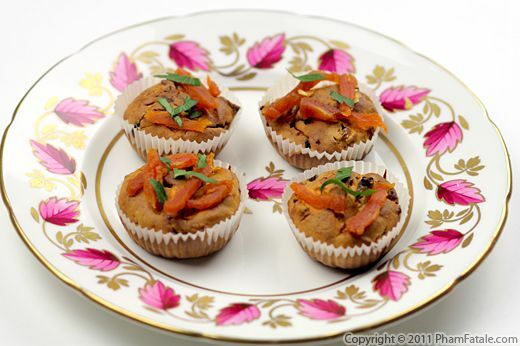 This time around, I flavored the muffins with mild stilton cheese, dried mango and fresh ginger. I prepared a full platter of mini muffins and served them with a salad of mixed greens and another platter of rolled smoked salmon (cold sliced meat would work fine as well), crème fraîche and slices of lemons. The weather is getting warmer, so a light lunch along with sweet treats and fresh cold drinks was really satisfying. In a mixing bowl, beat the egg with the sugar for about 4-5 minutes. In another bowl, combine the flour, salt and baking powder. Sift all the dry ingredients. Add the dry ingredients to the egg mixture. Mix well. Add milk, crème fraîche and butter. Add the grated ginger, stilton cheese, dried mango, fried shallots, 3 tablespoons parsley and chives. Place a mini cupcake liner in each mold. Pour in the cake batter. 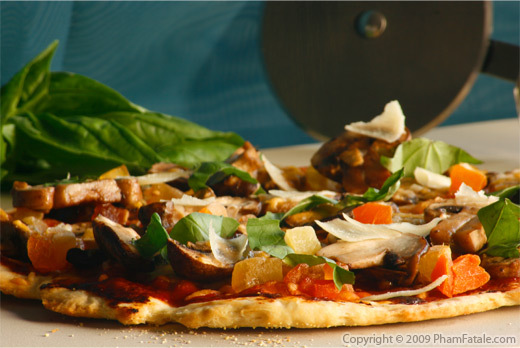 Bake for 5 minutes at 400°F; lower the temperature to 375°F and bake for another 25-30 minutes. 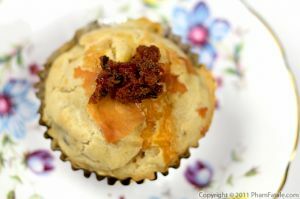 A toothpick inserted into a muffin should come out clean. 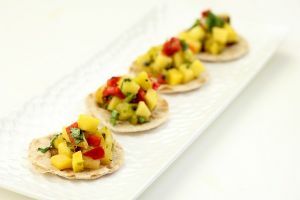 Garnish with more sliced dried mango if you like and decorate with parsley and chives. The recipe yields 36 mini muffins or 18 regular muffins. Don't forget to place a cupcake line into each mold for easy release and quick clean-up. Sifting dry ingredients helps get rid of lumps of flour and aerates the mixture when liquid is added. It's an important step in baking to get a moist result. I buy dried fried shallots at the Asian store. They're crunchy and very strong in flavor. You can also make your own by frying thinly sliced shallots. They add flavor and crunch to the cake batter. For a healthier version, you could replace the crème fraîche with more milk. Little reminder on how to grate ginger: Clean the ginger root and remove any dirt. Peel the ginger root with a paring knife (or the edge of a spoon). Grate the ginger with a fine mesh Microplane. 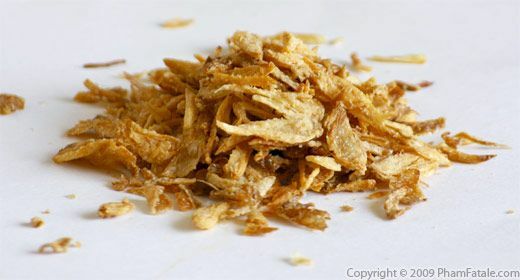 Gather about 1 tablespoon of grated ginger root. 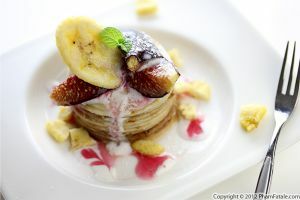 Check out the link for more cake recipes. 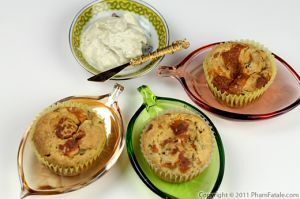 These muffins are easy to make and easy to transport, which are both important considerations if you're planning a picnic. 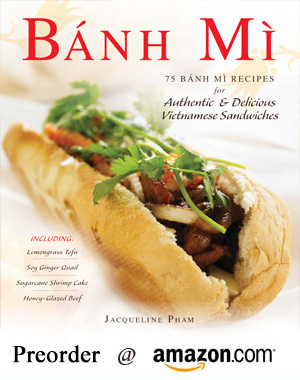 Published By: Jacqueline Pham on June 29, 2011.